SHIPPING company Streamline has lost its £12.7 million court action against the Scottish government over the awarding of the lifeline northern isles ferry contract to multinational service provider Serco. On Friday the Edinburgh Court of Session published judge Lord Doherty’s ruling that there had been no breach of public contract regulations when Transport Scotland awarded the six year contract worth £243 million in May 2012. 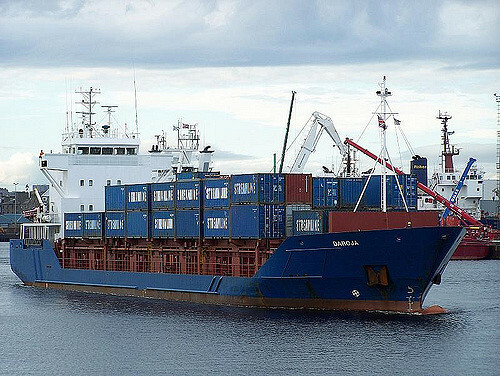 Shetland Line (1984), a subsidiary of the Streamline Shipping Company, claimed that the government had not been as clear as the law dictates in its specification for the freight side of the contract. Since the 1980s Streamline have operated a container service using load-on/load-off (LoLo) vessels transporting one third of Lerwick’s sea-borne freight, and almost half of Kirkwall’s. In early 2012 they submitted their bid for the six year lifeline ferry contract after a lengthy “dialogue” process with government officials led by Judith Ainsley, Transport Scotland’s head of ferries policy and contracts. Three other companies had submitted bids, though the previous operator, state-owned NorthLink Ferries, had been disbarred for failing to meet the quality standard for its freight service. In May 2012 Transport Scotland announced that Serco had been the successful bidder, at which Streamline immediately launched a legal appeal that held up the contract being awarded for more than two weeks. A Court of Session hearing finally took place over seven days in December last year, when Streamline managing director Gareth Crichton laid out the company’s claim they had been unfairly treated. He insisted that Ainsley had told him the bid should include provision for a LoLo freight service in addition to the roll-on/roll-off (RoRo) service provided by the lifeline ferry. Ainsley denied this was the case, saying that she had made it clear to each bidder that it was up to them to decide how best to provide a freight service on the route. During the evidence it became clear that Streamline had offered a better quality service than Serco, partly because they alone would have provided daily freight shipments throughout the year. However Serco scored better than Streamline on price, which accounted for 80 per cent of the score when deciding who should win the lucrative contract. Crichton said that had they been aware there was no need to provide a LoLo service as part of the contract, they would have presented a cheaper bid that would have beaten the £223 million one from Serco. However Lord Doherty said Streamline was presenting these “hypothetical” figures “with hindsight and knowledge of the winning bid”. The judge added that he preferred Ainsley’s evidence that she had left it up to the tendering companies whether to include a LoLo service in their bid. Had she insisted on an additional LoLo service, this would have given Streamline an unfair advantage over the other bidders as they already ran such a service, he conjectured. As a result he concluded that there had been no breach of the 2006 regulations around awarding public contracts. The Scottish government welcomed Lord Doherty’s decision, saying it “ruled strongly” in their favour. A spokesman said: “We have always maintained that we conducted a robust and fair procurement process for the Northern Isles Ferry Services contract and this result not only supports this but also endorses the approach we took. Streamline declined to comment until they had considered the verdict in greater depth. The full judgment can be found.